“Data as a Platform” is one of the most interesting trends to watch these days. I wrote about it in my blog few months ago – Data as a platform for the future manufacturing intelligence. Data is the most important sources of global internet growth.The next big wave here is to leverage the unlimited connectivity and storage to collect, aggregate, correlate and interpreter all sources of information to improve our lives and enable enterprise to operate more efficiently. 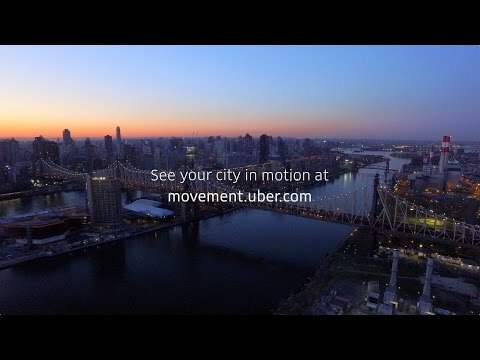 My attention was caught by Uber announcing new product and website – Uber Movement. The website is offering the access to its traffic data. Tech Crunch article gives you an idea about what Uber is up to. The basic idea is that Uber has a lot of insight into how traffic works within a city, and it can anonymize this data so that it isn’t tied to specific individuals in most cases. So where that’s possible, Uber is going to begin sharing said data, first to specific organizations who apply for early access, and then eventually to the general public. Uber says it was looking at all the data it gathered and began to realize that it could be used for public benefit, and assembled a product team to make this happen. The result of this effort was Movement, which aims to address problems city officials and urban planners encounter when they’re forced to make key, transformational infrastructure decisions without access to all of, or the proper information about actual conditions and causes. You can ask me how is that connected to engineering and manufacturing software. Platformization is one of the trends these days in engineering and manufacturing. Check CIMdata materials about it here. The definition of the platform according CIMdata here is a foundation upon which functional capabilities, data, and processes are enabled and executed. Nothing wrong with that, but here is the thing…. Traditional PLM platforms are about how to control data and processes in a specific organization. Although, it is still very important function for every organization, modern engineering and manufacturing organizations are global and interconnected with suppliers, contractors and customers. To understand manufacturing processes beyond single organization can be the next charter for PLM data platforms. It can help to build an intelligence platform that can capture and analyze how manufacturing companies are interconnected and how processes are organized on a global scale. It can take manufacturing industry to the next level of engineering and manufacturing intelligence. It seems like you are talking more about data-powered platforms. Data is data and cannot be leveraged without some way to manage it, analyze it, leverage it, etc. In this case traffic data is being accumulated and managed to assess traffic patterns. Data as a platform and future manufacturing intelligence.